So I am actually not looking to try to break into the game industry as an artist. Why did I read this book? Well, I am very much interested at upping my game when it comes to real-time graphics and content creation as a hobby. Computer graphics are just fascinating to me, and the best engine and shaders in the world will not save a shabby piece of art. This book seemed like a good way to get into the artist mindset. To top things off, the sticker-price was a palpable $12 dollars and the cover art looked great (important when taking art direction). Basically what the book amounts to is a series of chapters, each one describing a particular game art profession. Some of the jobs detailed include: concept, environment, character, ui, and marketing artists. Every chapter includes a job description, explanation of the process or workflow, example images, an artist profile, and finally a mock “help wanted” ad that could be for the position. The format is informative, and I think would be very helpful for a student looking to get into the industry as an artist. 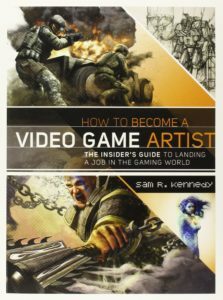 Certainly, you don’t have to be a student to find worth in this book and I personally feel it is a great choice if you are at all interested in video game art. The author, Sam R. Kennedy, is a game artist himself and shares a some of his (quite impressive) work within these pages. Nicely, the photos on the Kindle e-book were in color. This is quite important, and in my research I did stumble upon some game art instruction books from people with questionable artistic ability. Of course, you don’t need to be da Vinci to make a 3d model (especially not when working from good photos or concept art) but I can’t help but wonder what I’m doing taking advice from an amateur. That was not the case with this text. Kennedy is a veteran and has worked at Ubisoft on Tom Clancy games and the like. I felt pretty comfortable accepting his opinions. All in all, I was happy with the purchase and I’m glad to have the book in my collection. If it helps me (even a little bit) in improving my art that’s a net positive. In any case, it was inspiring and that’s enough for me.